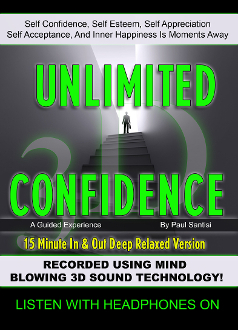 This is the quick 15 minute In and Out version of UNLIMITED CONFIDENCE in 3D Sound. Countless proven confidence building affirmations that will expand self esteem, self appreciation, self control, self acceptance and inner happiness. Make sure to wear headphones as this is recorded in mind bowing 3d sound. Great audio for all ages! Younger people absolutely will benefit in amazing ways! 1 hour listenanytime full length version also availble.